Every time Livingsoft releases a seasonal pattern collection, support is added for some new style or fashion trend that has proven popular that season. These new patterns often provide the basis for major new design enhancements that get incorporated into all patterns in the Dress Shop catalog. The newest features included with this collection are the floating tier skirts and dresses and the princess and panel blouses, dresses, and jackets. Both of these new style-lines are discussed in greater detail below with plenty of photos to show how they differ from prior style options. We had loads of fun and hard work with this collection- it’s very Now with some conservative every day garments, some evening clothes and suitable for the office attire. There’s something for everyone from late teens to golden agers. Spring/Summer 12 is a collection of easy wear patterns, many are looser fitting for those hot summer days, and some are clearly designed for the younger crowd. There are 25 versatile patterns to select from each having many options to personalize your designs. Versatile is the key word for this collection. I’ll give a few examples, the Pool cover up can be a gem to toss on at the pool or beach in French terry, an elegant peignoir robe in chiffon and satin/ devore, a fun lacy cover up to wear to a wedding over a mother of Bride or Groom Dress, or lovely in a nice little cotton as an around the house robe. The Vee Notch nightgown works up in lingerie knit as a shortie, or looks wonderful long and elegant in a jersey for an evening dress out on the town. 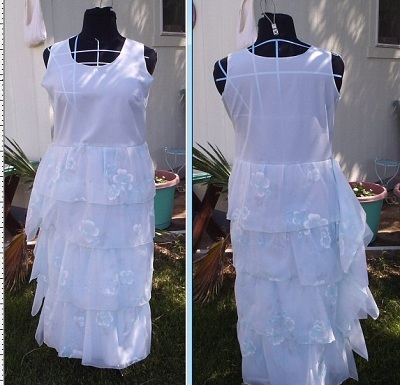 Here is Bonnie’s Vee Notch nightgown as a summer dress. The party dress wears short, young and cool out on date night or long and elegant with a shawl or bolero for any age. We all know the typical peasant skirt/dress shown at the right made of multiple tiers sewn together. That one has been in the program for ages. We have designed a refined flowing tiered skirt or dress where the tiers are lightly gathered and stitched directly to the underskirt of the dress or plain skirt. The hem of each tier floats freely. Rather than a full skirt, this one is carefully designed so you select the number of tiers and the percentage to gather. Each tier is scaled to the one above it both for around body width and depth. The refined lines and shaping of this skirt provide an elegant long gown, or modern party dress. 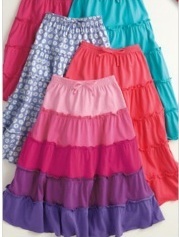 Skirts may be worn with a wide waistband, elegant metal or jeweled belt. Tiers may be alternating fabrics, chiffon then satin or lace or trimmed with beading, feathers, or lace. My prototype dress is made from a very inexpensive and aged fabric from stash yardage. I never intended to wear this- though it fits great and I think cute. I used only 4 tiers of 5 because I am quite short and liked the narrower tiers this provides – it seems more in balance to my total height. I had not cut each tier to length but rather 2 fabric widths (44) of the chiffon for each tier. I loved the way they draped on one side so finished the underskirt and then just finished the raw edges with a narrow rolled hem. You can adjust the number of tiers under options> shaping and finish as well as the amount of gather and of course the length under Options> Length. Some assembly tips: You will want to make the base dress bodice including zippers and skirt but do not attach the dress bodice and skirt at the waist. If using a stretch fabric for the base dress, you won’t need a zipper so change the closure to None. Sew ONE of the side seam of bodice or skirt as it is much easier to attach the tiers flat rather than in the round. Do not cut the tier pattern fabric just yet. In most cases you will need to piece the tiers (or will if you are my size). Lay out your tier pattern pieces on the base dress pattern. Starting at the hem, align your pattern pieces on the skirt so the fold hem line of the base pattern is either the same length or a tiny bit shorter. You will want to overlap the lower tier above the stitch line by at least ¾ of an inch OR MORE. The pattern default is for a 1 inch overlap. You might pre-finish the underskirt hem. Mark the tier cut line and stitch line on your paper patterns. Transfer those marks to your fabric, or if your fabric is sheer enough to see thru keep the pattern attached to the skirt portions. Decide what you like best for your tier arrangement labeling each tier from waist down by number. Mark the top and hem of each tier. If you are satisfied with the layout then cut your tiers. Piece the tiers as needed, press the seam line. The default overlap is programmed for 1 inch. Hem the bottom edge of each tier. Gather the upper edge, or form small pleats every 2 inches or so as you desire. This design concept allows you to make it fully and frilly, or lean and elegant, your choice. Carefully align the top edge to your lines on the underskirt matching both tiers and underskirt at the stitched side seam line. Pin; stitch each tier piece to the underskirt. Big Tip: start at the lowest one to keep the extra fabric out of your way. Finish the underskirt open side seam, then the tiers' side seams. Attach the bodice to the skirt, or on the tiered skirt, attach the waist band, finish the neck and armholes. The princess and panel blouse, dress, or jackets all have extra opportunities for shaping. Those extra pieces each allow for clean sophisticated lines! 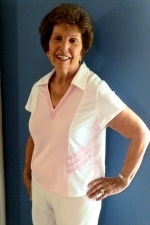 Here June did hers in 2 colors and it is the Hit on the Golf Course! 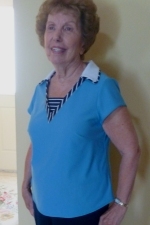 The little cap sleeve blouse is a must have for any summer day. I made mine in white cotton pique and just know it will be worn more than any other item from the collection. It’s such a modern staple! 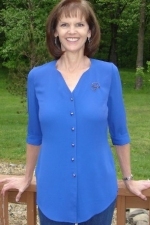 Luz made this gorgeous blue and changed the neckline to a Vee Notch. 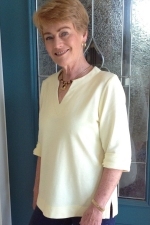 June’s inset, trim and contrast collar changes everything and really makes this simple blouse Pop! As you can see we have modernized tees, tunics and jackets and even tossed in a few vintage looks. 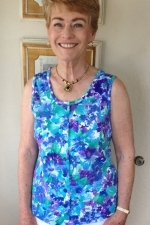 The button front cami made in a woven or stretch works as a top. Nancy made hers cool and comfortable. 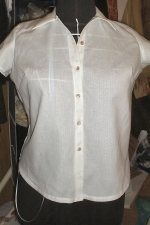 Default is set at hip length but adjustable to any blouse length. Wear with a skirt, shorts or slacks. The 2012 Cami shown on Bonnie and T-back cami are great for exercising, yoga and even as a swim top…just change the stretch percentage under fit/ease as desired. 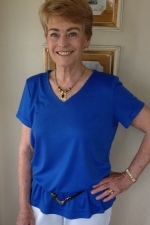 The square neck cami is a real hit with several testers. We love this one Carolyn made. The Vintage blouson dress is perfect in a lightweight knit- my choice would be a rayon, sophisticated for office or evening wear. The scoop neck has a short front button closure for added detail. You can adjust the lengths as desired. The slouchy tee was an easy to make quick fit hit. Wear with a purchased belt and tights or slacks for laid back afternoons, or even evenings out in a lacey knit over a cami. It is comfortably loose and thigh length when not belted – shorter when bloused over a spectacular belt. The floaty tunic is another option to wear with a fantastic belt. Wear it over an outfit as a sheer or as a “dress” in a knit or woven. There are two halter dresses, one with a trim midriff panel, and straight skirt, the other with a vintage look gathered skirt- OMG put on a crinoline for the max effect! This is Easy to make and even easier to wear. The Lapel Jacket has a pretty shaped lapel as the standout design element and no collar. Though lined you can finish your interior seams and face the front. Fabric of choice would be a linen like fabric. The Shawl Collar Jacket (pictured at the top of this newsletter) features 2 piece sleeves, and a softly curved waist depth front shawl. 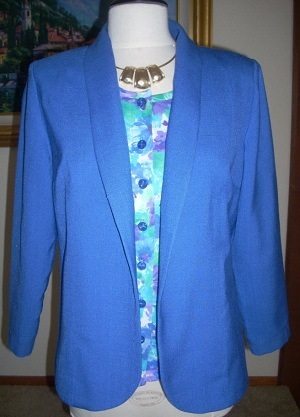 This is also a lined jacket at default but you can finish the interior seams and face the front. Linens and light weight gabardines would be perfect. This collection is a complete spring and summer wardrobe in one package. The test team did their usual incredible job working long and hard to improve every pattern. Thanks, Team!! Livingsoft generally offers only one collection for each season at any given time, discontinuing older ones as each new seasonal collection is released. That does not mean that those earlier collections are completely out of date, but rather that we want to keep the confusion factor down and make sure you find what is new when you go looking in the company store. But, those prior summer collections do have some terrific gems in them. So, for a very limited time, we will be offering all the prior summer collections at great discounts so everyone has the opportunity to catch up on any that you missed. 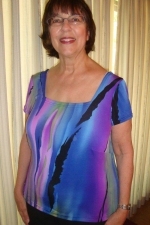 Now and through June 30, 2012, all of the Dress Shop summer collections are available and all are discounted. Act now to save up to 50% on these summer patterns!